Tango Salon World Champions in 2007, Inés and Dante are acclaimed young dancers, performing and teaching throughout Argentina, Europe and all over the world. Each have received recognition in a number of international contests and their classes are sought-after. Dante Sánchez was born in Comodoro Rivadaria where he studied folk dances since he was very young, and later became a dance teacher. When he turned 18 he moved to Buenos Aires where he became world champion of Tango Salon with Inés Muzzopappa. He has toured the world teaching as well as dancing for Tango+Tango. Inés Muzzopappa's learning process was natural and spontaneous since her 14th birthday, moment in which she was introduced to the tango masters of “Club Sunderland” in Villa Urquiza, Buenos Aires, Argentina. Among other art forms, Ines has studied ballet, singing and music, tools that gave her a solid artistic foundation and a deep understanding of the dance. Becoming world champion has allowed her to develop her teaching skills as she started to work in different national and international dance festivals (1st Tango Festival in Comodoro Rivadavia, Pulpo’s Tango Week and the tango festivals organized by the city of Buenos Aires), as well as in the most recognized dance schools in Argentina (“La Esquina” dance studio, “Carlos Copello” dance studio and “Escuela Argentina de Tango”). Dante and Inés met at a dance class taught by Carlos and Rosa Pérez in 2006. 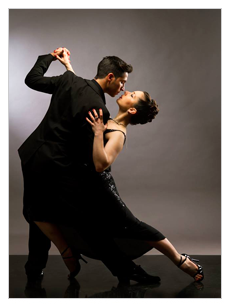 The following year, they registered for the City Dance Championship and finished second in the Salon Tango category and fifth in the Milonga category. In the same year, they were crowned World Champions of Tango Salon 2007. After going separate ways, they have recently reunited for a world tour, teaching and participating in festivals. This event took place on the 19th of October 2013 in Cambridge, organised by Tangueando.net.